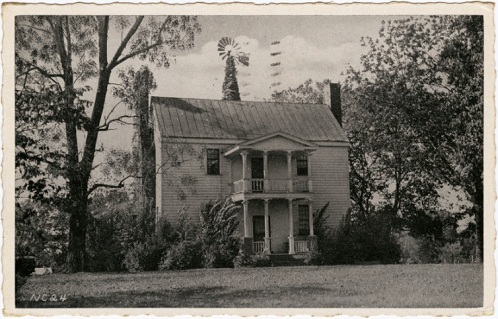 The Nancy Jones House, located in Wake County on what was once the main stage road between Raleigh and Chapel Hill, was possibly built around 1803 by Nathaniel Jones, father-in-law of Nancy Jones. Nancy's husband, Henry, inherited the property. The two of them operated a stagecoach stop and tavern out of the house, although Henry was primarily a farmer who left the running of the tavern to his wife. The house is purported to have served as the setting for one of the state's favorite legends. Tradition holds that in 1838 Governor Edward B. Dudley of North Carolina and Governor Pierce Mason Butler of South Carolina stopped at the house during a trip between Raleigh and Chapel Hill. The governors consumed servings of apple and peach brandy, and between rounds Dudley reportedly said to his colleague, "It's a damn long time between drinks." The quote has also been ascribed to Governor John Motley Morehead, who supposedly said it during a tense meeting with South Carolina governor James H. Hammond in the 1840s. President James K. Polk, a North Carolina native, stopped at the Nancy Jones House on his way to Chapel Hill in May 1847 to deliver the commencement address at the University of North Carolina. Governor William Alexander Graham and former governor Morehead joined him at the house. Union general William T. Sherman and his troops bivouacked in the vicinity in April 1865, but no damage was done to the property. There is some indication that Nancy's son, Adolphus, operated a school out of the house following the Civil War. The Nancy Jones House still stands as a private residence. Richard Walser, "Damn Long Time between Drinks," NCHR 59 (April 1982). Lally, Kelly A. The Historic Architecture of Wake County. Raleigh, N.C.: Wake County Board of Commissioners. 1994. Blevins, Audra. "Brokering Success: ‘Bittersweet’ Sale of China Press Exceeds Expectation" WorthPoint.com. Posted March 2, 2010. (accessed June 12, 2012). "The Governors Meeting Place" in Durwood Barbour Collection of North Carolina Postcards (P077), North Carolina Collection Photographic Archives, Wilson Library, UNC-Chapel Hill. http://dc.lib.unc.edu/u?/nc_post,8273. 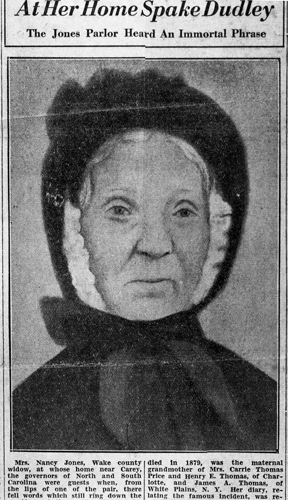 Newspaper article about Nancy Jones with her portrait. Call no. ConDev63-386A. Image courtesy of the State Archives of North Carolina.